Unplug the pwb and upturn it. 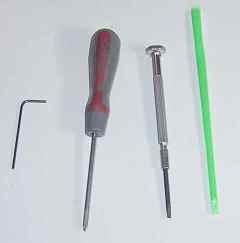 Remove the battery with the help of coin (half a turn to unlock) and remove the two screws. 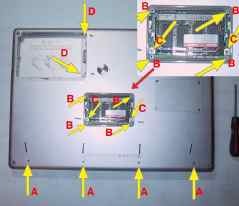 Next the 4 screws (B) which unlock the RAM door. And still two screws (C). Finally, the 4 screws (A) on the shell. Caution: these screws has been sealed, so they can resist. 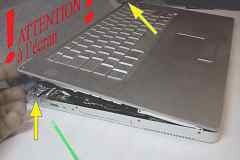 And when reassemblying the pwb, do not force on them. If needed, clean their heads to remove the remain of sealt. On the right side of the machine, 3 more screws. Same on the left one. 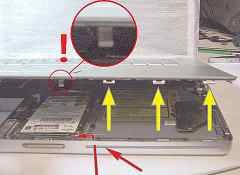 On the rear, 4 screws: first remove the two ones above..when the machine is not upturned (the ones closest to the screen). Warning: protect first the screen. Then insert a plastic spatula under the upper plate and turn the spatula of half a turn to unhook the plate. Do not lift up the plate too much to avoid damaging the small clamps on the hided face of this plate. 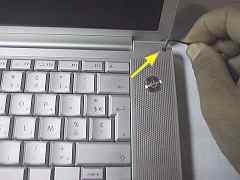 We have to unhook the lug which lies inside the machine and which is only reachable through the DVD slot! 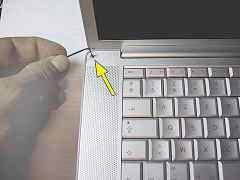 So: to unhook the lug, we have to introduce the hook on the left side of the DVD slot and slightly pull. 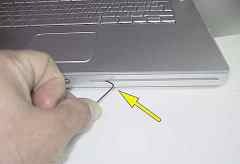 Please, do this smoothly, with the hook the more vertically as possible. It is rare that one can do this in the first attempt! When this is done, there are a few lugs on the right to be unhooked with the plastic spatula. 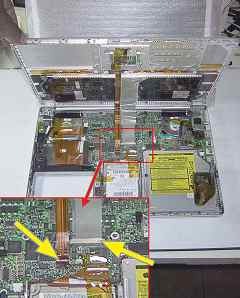 Once the plate removed, unplug the two ribbons which connect the keyboard to the motherboard. The first one by simply lifting it up, the second one has to be unhooked. 2. doing this can damage them... they are so tiny! Here are where those marvellous tiny screws are loacted ;-). Do not forget any of them otherwise you will damage the keyboard when extracting it. 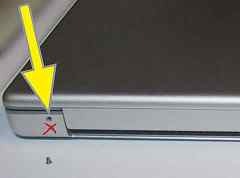 When the keyboard is removed, we have to unhook the last ribbon on the other side of the plate and which passes through a slot in the rear part of the keyboard (blue arrow on the picture below). The red arrows show the stickers we have to removed before inserting the new keyboard but which have NO TO BE replaced by the ones included in the package. Because the new ones are not transparent (great!) and will prevent the keyboard backlighting to work properly. 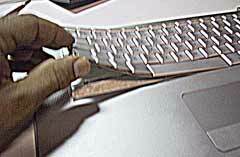 The other ones are compulsory to fix the keyboard on its support. Insert the keyboard exactly as shown on the picture: first the lateral sides, then next apply an uniform pressure on its whole face to move it down and to stick it on the new replaced stickers..especially in the corners. 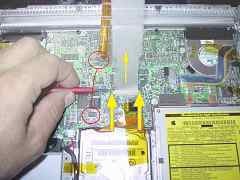 Do not forget, in the reassembling process, to put some tape on the screws to avoid them to touch the motherboard when the pwb will be closed. And... yes... last but not least... do not force on the 4 screws on the lower part of the shell!